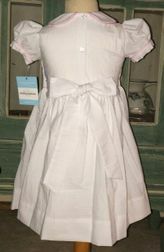 An absolutely beautiful white seersucker smocked dress by Anavini. 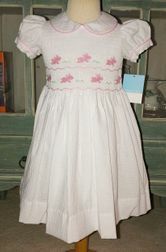 The dress has a pretty Peter Pan collar piped in light pink fabric. The sleeves are also trimmed with light pink. 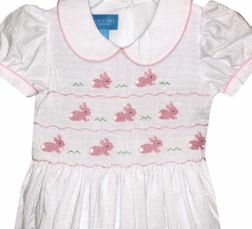 The smocking is hand embroidered with pink bunnies with the size 4t having 3 rows of bunnies instead of 2. The dress has sashes that tie in the back in a pretty, fluffy bow.